If, like me, you’re tired of spending your days rearranging tight pencil skirts or battling short hemlines the moment the wind kicks up, it’s time to invest in a pleated midi skirt. A classic piece, the pleated midi skirt goes down in history as being favoured by some of the world’s most beautiful screen icons including Elizabeth Taylor, Grace Kelly and Marilyn Munroe (in THAT photo over the New York subway vent). In more recent years they’ve been spotted on the likes of Taylor Swift, Kiera Knightley, Rosamund Pike, Sarah Jessica Parker and Joanna Lumley – proving their a timeless option for all ages. While the style first returned to the catwalk in 2014, it’s taken me a while to get on the bandwagon. I’m not sure if this is because of the pleated skirts I wore to school, the fact I’m not overly keen on elastic waistbands, or simply because I have yet to master the art of ironing. Whatever it was, I wasn’t interested, until mid last year and since then, I’ve added five to my collection; a navy wet-look version (bought in-store last week), rose pink one (reminiscent of Grace Kelly’s in How To Catch A Thief) and red, all from Topshop; a silver/gold metallic one from Zara and a black French Connection one. And they’re all on fairly high rotation when it comes to my daily workwear. Naturally, my favourite way to wear them is with a striped top, whether that be a tank, t-shirt or shirt, but if you’re looking for additional inspiration, Pinterest is filled with thousands of images of ways to wear them for work or play, with heels or sneakers, on a date, to dinner and, of course, to the office. Channel your inner rock chick with a slogan tee, bomber jacket and sneakers; dress it down for a day in the office with a denim shirt and bright heels; or glam it up after dark and with sky-high statement heels, a silk camisole and a leather biker jacket. 1.Asos Midi Skirt in Pleated Satin, $69 | 2. Witchery Pleated Skirt, $149 | 3. Piper Petites Pleat Lurex Skirt, $89.95 | 4. Atmos & Here Samantha Pleat Skirt, $59.95 | 5. Jane Lamerton Animal Print Pleated Skirt, $$129.95 | 6. SheIn Metallic Contrast Pleated Midi Skirt, $27 | 7. Portmans Metallic Pleated Skirt, $99.95 | 8. Asos Pleated Skirt in Metallic with Sports Waistband, $59. I have! I got mine at Topshop last week and I was in the Brisbane store today and they had them. It’s called the Jersey Pleated Midi Skirt in navy. It’s in one of my pictures (with the blue and white long sleeves shirt). Thanks, will have to call them. Not online, the perils of country living! 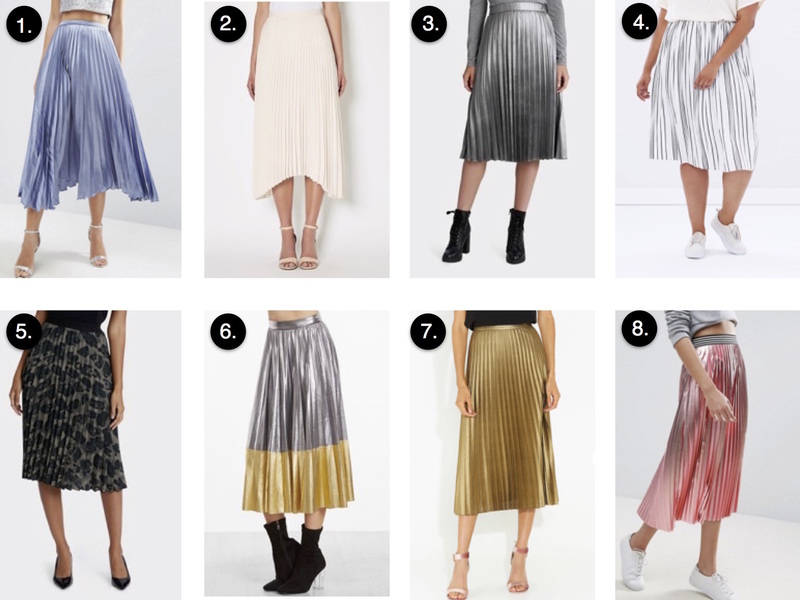 How do you wash/ iron these skirts to keep the pleats still looking like ‘pleats’? Or are these a dry clean only piece?